Your business is important to you. You want it to stand out, sell and be wildly successful. Having a sharp, distinctive professional image will help you achieve this. Enter your designer. While you can often fault them for wearing black merino wool in excess, a designer will help make your business shine. By tailoring brand strategies to fit your specific business needs, a designer will carefully craft your identity system to look and function its’ best across all your marketing channels. If your business idea is unclear, more time should be allowed to help any good – albeit cloudy – idea come to fruition. Design and brand strategy comes at a cost and if you require your designer to start from scratch with little to no market research and the core concept of your business is not succinct, you will spend more time and money on turning your ideas into something more concrete. A strong brand concept is built around (1) the quality and clarity of your idea and (2) your understanding of your audience. 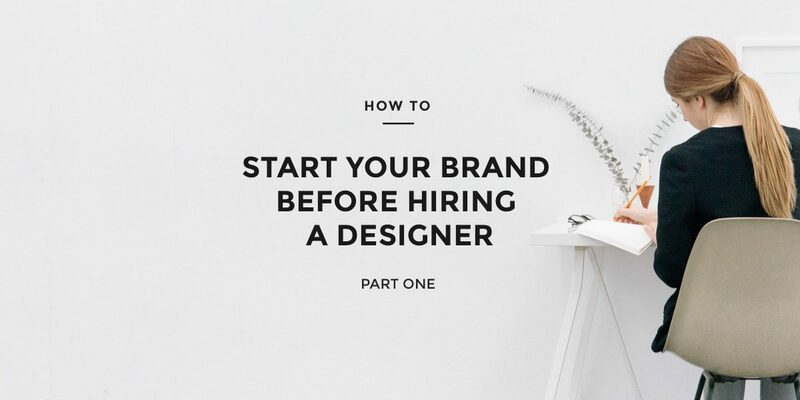 Before hiring a designer, there are two important steps any business can take to begin moving their own branding or re-branding process forward. Although very basic, they often yield cost and time savings when starting a new branding project. Focus on defining your mission, vision and brand statement. You want to attract positive attention. You want people to trust you and diminish any noise around your offerings. In order to have your brand message ring out like a bell in an already busy market place, you need to deliver a crystal clear perception of what it is that makes your product or service so fantastic. The goal is to be so concise with what you offer that any design decisions can be made easier. How will your product or service make their lives better? Use research and analysis: Pinpoint what your customers need and cannot be without. The most important foundation to a brand is a clear understanding of what you are selling, why and to whom. This, eventually combined with a strong visual identity and a defined, but pivotable marketing plan that will help you create a laser like focus on your product that will start attracting customers to your business while you sleep. Understand your audience but avoid binging on what everyone else is doing. Sure, you are obsessed with Ikea’s website and Amatic is totally your favourite font right now, but be careful. If you get hung up on just making something visually appealing to what you like because you just really like it and you think it works for others, then you are looking for problems. Your main focus should always be you – your business, your brand. Analysis of counterparts are important, but don’t build false brand expectations for your project. Build your brand on its own merits and position it accordingly against its competitors. Early ideas for visuals should be put aside for now into a mood board folder on your computer or a physical notebook dedicated to creative brainstorming. Then walk way. Be strict with your creative brain and focus on the most important questions at hand: Why is what you are selling the best, and who wants it. Once you firmly recognize what your audience wants and needs you can then start to effectively manage the perception of what you can sell and how. This is key to getting started on the right foot to creating a successful brand image. So, are you ready to bring on a designer? If your budget allows it, bringing a designer in early to help you develop a better sense of what you are selling and to whom might be really beneficial to your project, especially if you are a busy entrepreneur. The most important take away is that being able to clearly pitch your idea and understand your primary market will definitely save you time with your designer. That said, if you are still struggling with your concept, professional design help early on might be exactly what your venture needs to start taking on more concrete and profitable shape. Interested in a more in-depth process you can do yourself to help guide your brand to successful start? Meredith is the Design Manager and co-owner of Merian Media. Like what you're reading? Sign-up to receive infrequent but awesome design articles and giveaways straight to your inbox.